For over a year now I have toyed with the idea of documenting a day in the life once a month as Jill, Amy, Michelle and others do, and of course toyed is all I ever did. My excuse was that Photoshop made me cry just doing simple actions so I was scared (to put it lightly) to attempt resizing and making a collage. Today, while poking around the free* editing program Picnik, I discovered how to do collages with an easy peasy click and drag. No tears. No pulling hair. No grumbles. I wish I had a bullhorn because I want to shout to the world how happy I am about this discovery (even though our neighbors might not appreciate that). 1. I started my Saturday off on the right foot with a fresh cup of coffee. I big, glitter-crusted, puffy-heart l-o-v-e my Keurig. But I think you knew that already. 2. Since I've recently become infatuated with all things Mrs. Meyer's (particularly the Lemon Verbena) I thought I'd wrap some up for Annelise's sweet teacher for Valentine's Day. Mrs. Meyer's yummy smelling products make me actually want to clean. Mostly. 3. Worked on my list and sub-list and sub-sub list for a little trip we're taking soon. 4. Coerced Annelise into sitting through torture a photo session for her Valentine cards And yes, she was sitting in a tree. 5. Cleaned our bathroom sinks, because...EWWW. 6. We have a darling new yarn shop in our area, which is wonderful but also dangerous. The last two times I popped in I left with these irresistible multi-colored yarns. I have big plans to knit a hat and a scarf for our little trip, but of course I haven't started yet. 7. Photo documenting the awesomeness of Picnik and the birth of this collage. 8. Listened to Mumford & Sons while I fiddled around. They, along with The Avett Brothers are my siren song bands right now. I can't help myself. 9. I'm finally almost finished with The Distant Hours by Kate Morton. Such a good read, love her books. 10. My big salad for lunch. That's a whole lot of chewing, my friends. 11. Working on Annelise's valentines. Exact-O knives always scare me, but thankfully no one was maimed in the making of her valentines this year. 12. Annelise wrote her friends' names & stuffed the envelopes. And ate one Tootsie Pop when she finished. At first it seemed overwhelming to try and snap 12 photos of different daily (i.e. mundane) happenings on the same day, but as it turned out, it wasn't bad at all. It was actually kind of refreshing to use my camera throughout the day. Doing this once a month is totally doable and a nice substitute for a 365 type project (I've always fizzled out on those), I'm looking forward to doing this again. *Picnik is free and I've used the free parts for the last few years. Today though I bit the bullet and upgraded to the Premium Picnik, but since Picnik is easy (as in doesn't make me cry) and our Photoshop Elements won't work on our Mac, I decided it was totally worth it. Have you ever made a photo collage? 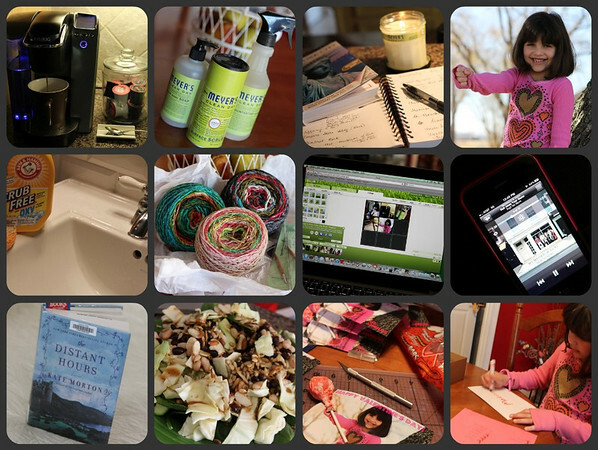 Have you documented a day in your life like this? Ever done a 365 or 52 type photo challenge? I freaking L O V E Mumford & Sons!!!!! Wow, way to be on the ball and actually get this posted on the 12th! I'm glad you're joining the fun and so glad you found a pain free way to do it. I love Mrs. Meyer's soap and was very happy to see it at Wal-Mart today for over a dollar less than I have been paying for it. Ah, the Distant Hours... The highlight of my winter, I think. Except maybe that whole trip to Mexico. cool! I will have to check out Picnik. I was sad when my photoshop didn't work w/ my mac and I still don't do very well w/ what I do have on here. seems like not as much, but I know that can't be right. I want to do a photo project, but haven't started yet. I want to find things to photograph that look like letters so I can spell out my kids' names. Have you seen those before? YES! I love picnik! That is how I made my header and it was easy peasy! I love Annelise's V-day cards! They are precious! I big, glitter-crusted, puffy-heart l-o-v-e Picnik. Photoshop freaks me out a bit, too. And I love, l-o-v-e Mrs. Meyers. We should be friends. Good for you! I love this project as I've always found 365 or Project Life such a bear (and burden). I forced myself to figure out PSE but am off to check out Picnik - maybe I can get more friends involved if the process is less painful :) LOVE the cards and miss my kids not being small anymore! I love your grid! Mrs. Meyer's is my fave and I've recently stocked up on the lavender. A new yarn shop? Your yarn cakes are gorgeous, so vibrant! That salad looks a lot like one of my favorite salads. Finally, Avett Brothers + Mumford & Sons? Let's be best friends. I love Picnik and use it all the time! It's so simple and has so many great uses! I started a 3rd blog at the beginning of 2010 with my best friend where we post a picture a day. Last year we took turns picking a topic but this year we are just posting- anything random- and it's been super fun. This year we both also bought Project Life which is a fabulous way to easily scrapbook a year. We live in different cities so we video chat while working on them together which is fun. Project Life is so cute and all that we have to do is print out our pictures and do a little bit of journaling. Here's a link if you'd like to check it out! That yarn is gorgeous. Love it. I also love Piknik! Holly I'm so glad you're playing along. I enjoy Kate morton books & finished that one a few months ago. Wish there was another one. Didn't you just love the characters? Yarns store, fabric stores I agree are very dangerous.